The next part of See the Star comes out this evening, and I completed it before it does. Something I'm not behind on, yay! I like the way the colors are coming together, and I hope to keep up to date with this one. I caved and started something else this week, but it's small and for a good cause. 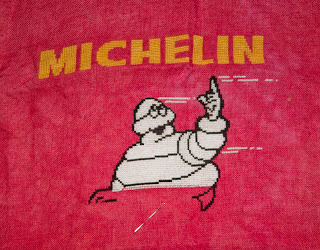 Elke, one of the owners of the Marquoir group, is taking hearts drawn by children and turning them into cross stitch designs. She has 31 of these and they're to be used for a German children's charity. I volunteered for one, and ended up getting two. This is the start of the first one. Since the picture on Saturday, I've almost completed this one. You can see more on her blog. Hopefully, this one will be done today. With my fondness for overdyed floss, is it a wonder I switched out a lot of the original colors of this for overdyed? I'm liking the results so far. This is still part three, and there's a bit more of it to do before Tuesday, as the new part comes out on Wednesday. I should have it done easily. We didn't go anywhere this weekend; my host got sick, and though he wanted to travel, I refused to let him do so with a fever. Instead, we went over to someone else's house and played Pax Britannica. It was interesting, being the US in the late part of the nineteenth century. Yes, I'm a real geek. I play war games. I doubt many of you do, because it's one of those rare traits. I did work on this during the Congresses of Europe where the US wasn't invited. Got quite a bit of stitching done. Bibi's coming along. This week I did some white again and black. 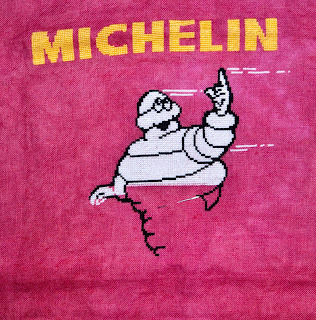 The black line going down is the front of Bibendum's leg on the bicycle. I'm definitely over halfway on him now, and the big white guy's end is in sight. Well, more brown and more red brick this week on the buildings. You can see the right hand building next to the center taking shape. It's still fun and is coming along slowly but prettily, I think. 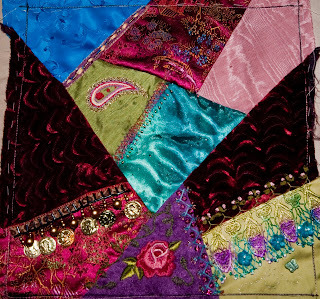 I finished another crazy quilt round robin block yesterday. It's for the Anything Goes Traditional round robin, and is Gerry K's block. I brought her block and one other on my trip to Kosovo. This top picture is after Lisa's wonderful work on it. Here it is after my work. I did three seams and one motif - the chain stitch paisley. The coin trim is one of the things I picked up in Split last year during the Croatia vacation. The rest is just silk thread, some silk ribbon, and the beads I brought with me. I think it looks pretty good. I started part three of See the Stars this week, and it's getting a bit more colorful. There's a -lot- to part three, though, so it's putting me behind on some of the other pieces I've got the stitchalong deadlines on. Not to mention my other stitching. It's still cold here, but at least it was sunny today. The daffodils and tulips are coming up on the embassy grounds. Hopefully the snow won't kill them. I started this a bit back, but wanted to keep it secret, so I didn't post it. It's the beginnings of a compass rose, and since the person it's for took the picture, I think it's safe to post. The fabric is a Silkweaver solo and the floss is from Vikki Clayton. I've added almost all the bling to Camelot. Most of it was done while I was traveling to Kosovo. Five hour layovers allow you to do needlepoint! I did get some strange looks in the Air France first class lounge in Paris - first for being one of very few women, and then second for the needlepoint. I ignored them. It's a nice, if cold, day out here. The sun's out and it's warming up well. Maybe we'll have a good weekend and can go out exploring! I added a few more lines to Bibendum last week. It was a full two lengths of thread, but he's fat! I'm definitely halfway done with him now, and next time I work on him, you'll see some outline leading to his bicycle. 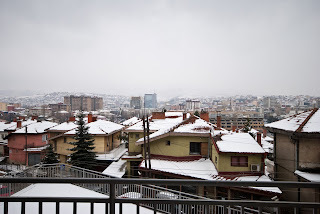 It's another chilly day here in Pristina. At least it's not outright snowing, but the sky's gray and cloudy. These are pictures from our back porch. It's all snowy and such, and though these were taken yesterday, the scene's much the same today. We're elevated and on Dragodan hill, so there's a very pretty view of the city below. The middle of this is filling in nicely. I've got a lot of the leaves in the center ornament done and the background is almost complete. Here is part five completed. Somehow I've managed to fall a section behind on this piece - part seven was released yesterday. On the other hand, I'm pretty close to caught up. I'll finish stitching up part three of See the Stars and then get on to part six of this. Maybe I'll have it done before part eight comes out. I'm very thankful to Tam of Tam's Creations and the Marquoir group for allowing me to stitch this great design. Another house nearly done now. I still like that I can work on different parts of this and see them develop pretty quickly. Well, pretty quickly for me. We went out to the grocery store this afternoon and will be staying in all weekend here. There's supposed to be six inches of snow and the streets are already slushy and grey. I am almost halfway done with this piece now. When this picture was taken on Friday, I was almost done with part five. I finished the part before I left for Kosovo. 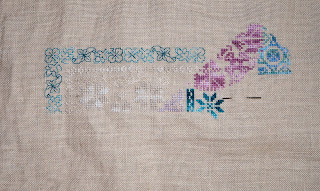 There was more cross stitch in this part than in the previous, but the blackwork was pretty dense. I like the colors I've chosen and how it's coming out. 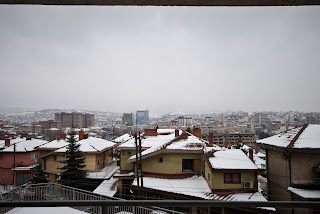 First, I made it to Kosovo with no problems! I'm sorry I didn't post yesterday - I was just very tired from the flights. Things went very smoothly and well. I'll start posting pictures soon. 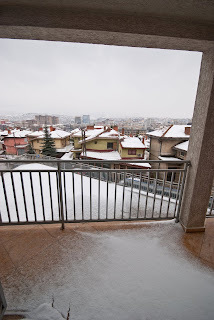 It snowed last night, though... not something I wanted to deal with. It's even colder here right now than home. Anyway, back to this block. I made it for another round robin; it's pieced from a combination of fabrics from my regular stash and ones given to me. Hopefully it'll look pretty good when it gets back. Still working on getting the bling all the way around the four sides. I'm almost done with it, and working on it's giving me design ideas. It's on the plane with me, and hopefully I'll get some done sitting in airports in Paris and Vienna. I completed this late last week in preparation for going on my trip - now I don't have to take it with me! I really like how it turned out, and I will finish it into a pinkeep or boxtop when I get home. This is the third part of Zentangle, all done. I received the fourth part via email this evening, but I am not working on it until I get to Kosovo with it. I've been busy packing and such today - and will be leaving tomorrow evening! I'll still be updating my blog daily, though, and bringing stitching with me. I'm almost at the end of band eight; all that needs to be done is the rest of the bottom line. The problem with this, like the problem with the top line, is that I unplied soysilk to do it. This makes it -very hard- to work with. It shreds and falls apart if you look at it funny. I don't think I'll do it again any time soon, but I need to continue in order to get this band done. After spending so much time on Part One, I did all of Part Two in one week. All that's necessary is Part Three and it's done. No cross stitches were in the second part, only Jessicas. I think it's looking pretty elegant. This stitchalong has been moving really fast; I'm about halfway done. 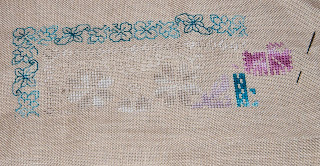 I've got a lot of blackwork to do on this section, too, but it's got more green than the others so far. This is the third of the round robins I'm currently participating in - the one where each person embellishes a small block. Simona's theme was under the sea. It's a popular one going around in the group, but this was the first I'd worked on and I wasn't really inspired until I got the idea for button crabs. Then the rest came together. I've got coral, fishies in the kelp, some starfish, some pearls, and the crabs. They were super easy to do and I think they came out cute. I added a lot more squiggles this time and finished them up for the moment. Next step is a dark green wavy line ... the last delimiter of the piece. It's getting pretty close to done, but it looks like the actual finish will have to wait for Kosovo. This week, I worked mainly on the left light panel of her skirt. There are a lot of blank areas - they all get beads. 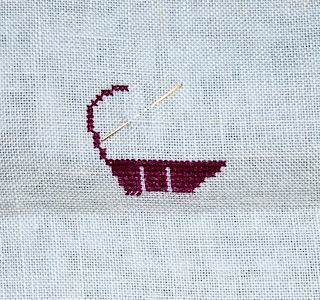 I'm getting less stitching done than I'd like this week, as I've been doing a lot of running around doing last minute things before the trip. My husband just finished framing this over the weekend. It only took him a few months, and he doesn't do things out in the garage in really cold weather like we had this winter. I think it looks very good and he did a great job! Yup, a lot of white back and forth, back and forth. He's coming along, though. After all this time, I finally got part one done on the workshop. The frame's done and so are the inner parts charted so far. I think it looks pretty good. Now on to part two. The side areas I stitched this week look like a laurel crown to me. Of course, that's not what it -is-. The giant egg's getting filled up fairly quickly. I finished the other big flower and even started the bottom edge of the eighth band. All that's left of this band is a little bit of green and the rest of the bottom edge. I'm getting there. It snowed here on Monday. I -hope- it was the last snow of the winter. Obviously, Mattie the wonderdog doesn't. She will sit out in the falling snow and just let it cover her, happy as a clam. She's around a hundred pounds now and a very gentle and loving dog. Here she is in the snow again. 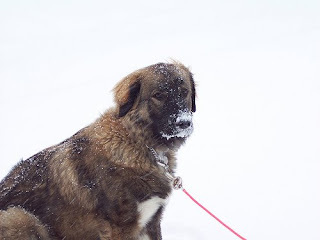 One of the other things she does is play in the snow by burying her muzzle in it. 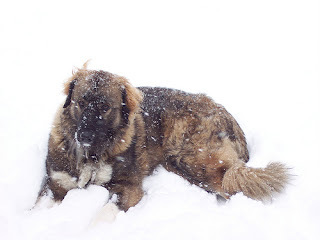 Sometimes she'll try to dive and bury her whole body in it, making snow puppies all over the yard. I could call them something different to go with the measles, but I think I'll stay with squiggles. I think they're actually leaves. The town looks like the beginnings of an architect's drawing now. I like that I get to work on different parts all the time, and I'm certainly not bored with it. This week has really been all under the flag on the left. Doing this part makes me realize how much of this I've already done and how little there really is to go. I hope I can speed it up, but probably not. 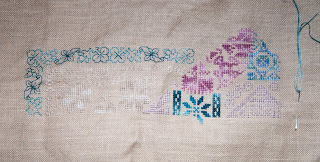 Here's the spring mystery from yesterday all stitched up for part four of ten. It's going really fast. I've already got part five, but I'm going to do part three of Zentangle before returning to this. I was the first to work on Lisa B's spring block for this round robin. 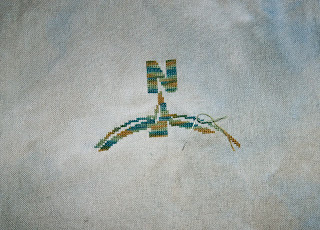 Here's an overall view of what I stitched. And this is a closeup of the tulip I did in petit point on the somewhat-evenweave fabric. To me, tulips are exemplary of spring. I also did this faux-ribbon seam. I think it came out pretty well. We have a yard covered in trees. I know it's spring when they start budding -not leaves, but flowers. So I made this branch to show that, too. Then I added little white flowers for another seam. Lisa's already said she likes it. Now on to try to complete some more things before I leave in thirteen days. 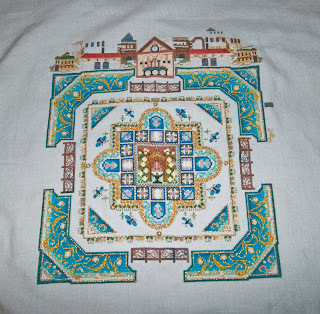 This week, I got all of part four of Tam's spring mystery done except the cross stitch outline. After the picture, I finished it on Saturday. 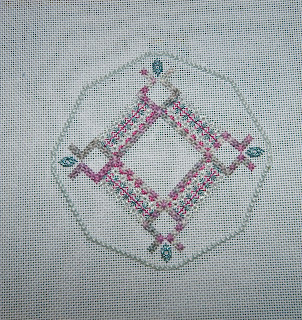 I'm kind of surprised that I have been able to keep up with all three of the stitchalongs from my German group so far. I have a feeling it won't last much longer though, since I'll be leaving two weeks from today. The instructions said to work this quarter in this way and didn't mention the other three. That is, until the step that comes next and assumes that you did all four. So I need to go back and do the other three this week and then go on to other things. I think the ribbon effect is kind of neat. I'm kind of disappointed in myself because I only finished two things in February after the great start of nine in January. This morning, though, I got my first March finish done. Blog entry and pictures later. Bibendum's showing his rotundity now. The black outlines are about to the point where the bike starts, and I'm approximately at the halfway point now. He's still cute.